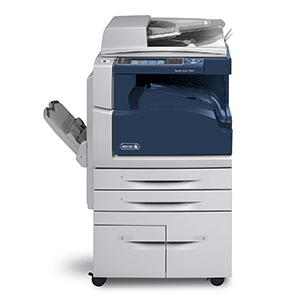 One of the more robust copiers you can get on the market is the WorkCentre 5945i copier from Xerox. The copier goes 45 pages a minute and is built to last. This is the copier we suggest for teams of 10 plus or people who do a ton of printing (more than 15,000 pages a month). Here is an online demo of the product. Check it out, you will see a lot of specs and how Xerox views their product. We work with companies on their setup, their installation and their leasing of a Xerox WorkCentre 5945i copier. We can help your company avoid hidden fees, we offer copier lease buyouts and would love to work with your company. We have technicians in the Denver area, and throughout the entire USA. We would love to help you with your copier needs. At the moment of this writing we would do a Xerox WorkCentre 5755 instead because that unit is on an amazing special. Nevertheless, this is an awesome copier. We always help our clients get the very best deal and ensure right sizing of our quotes. Give us a call if you are looking for a copier in the Denver area! Build your own with the Xerox configuration tool.